Rockets player-coach Nichola Cooke in action v Abercynon. Pic: Craig Thomas/Replay images. What’s that lighting up the night skies in the Valleys? Probably a Rhondda Rocket, who are scorching towards the title in the A470 netball league – and blazing a trail for others to follow behind as Graham Thomas discovered. Rhondda Rockets are powering towards their first title as they bid to shake up the solar system of Welsh netball. Player-coached by former Wales international Nichola James – now Nichola Cooke – the Rockets have two games remaining and a narrow lead at the top of the A470 League. If they hold onto top spot then it will be a first planet conquered by the Rockets who have bigger galaxies on their radar – such as one day being part of an all-Wales national domestic league or something even larger. Those are the end-of-the-telescope ambitions for the Rockets, who are part of the rapidly growing Rhondda Netball programme, reinvigorating the sport in the Valleys. But any new sporting organisation has to safely negotiate the small journeys first, before they reach for the stars. Netball may be on the launch pad to the big time, with a UK-hosted World Cup around the corner and increased interest in the Superleague, but you need the fuel of grass roots enthusiasm and player pathways before the engines are truly heated. If anything highlights the haphazard strangeness of league netball in Wales, though, it was the appearance of Superleague player Georgia Rowe for Abercynon, the Rockets’ opponents a week ago. The A470 League is one of a number of local leagues that are spread throughout Wales in the absence of one over-arching national competition. RCT Rockets v Abercynon. Pic: Craig Thomas/Replay images. It’s bit like turning up to play for your village rugby team and then finding Wales captain Alun Wyn Jones winking at you as he towers above you at the first line-out. Rowe, an imposing former Celtic Dragons shooter now with Severn Stars, tipped the balance in Abercynon’s favour, handing the Rockets a rare 31-23 defeat. It was the Rockets’ second defeat of the season in their season in the league. Last year, they finished third, but their fortunes have improved since Cooke arrived as player-coach. Cooke says: “We played a team the other night who had a current Superleague player playing for them. There’s no rule against it. The Rockets lost that one, but should still win the league, one of a handful that sit at varying levels beneath Superleague, the home of Wales’ only semi-professional team, the Celtic Dragons. Capped 45 times for Wales, Cooke – then James – was a Celtic Dragon back in the days when the Cardiff outfit were not always in the wrong half of the table. In 2013 she was part of the Dragons side that reached the Grand Final that year, before losing out to Bath in a five-point match. After playing at two World Cups and a Commonwealth Games, she withdrew from the top level in 2015 after representing Wales at the World Cup in Sydney. The Swansea-born player then stepped down for a stint with Cardiff Central in the Cardiff and District Premier League, whilst also honing her coaching skills that had begun at just 18, and starting a family. “I like player-coaching and don’t find it difficult to take people on and off court. I would be bored if I was just doing one or other and I think the girls give you more respect if they know you can still perform on court. The Rockets represent the top level and a focus to aspire to for all the hundreds of girls who train and play within Rhondda Netball – from the ages of five and upwards. They run two further senior teams – the Rhondda Royals and the Rhondda Ravens – as well as the Rockets U17s. Players are fast-tracked up the age-groups whenever opportunity arises, in the hope that a conveyer belt of talent can be fed into the Rockets in years to come. 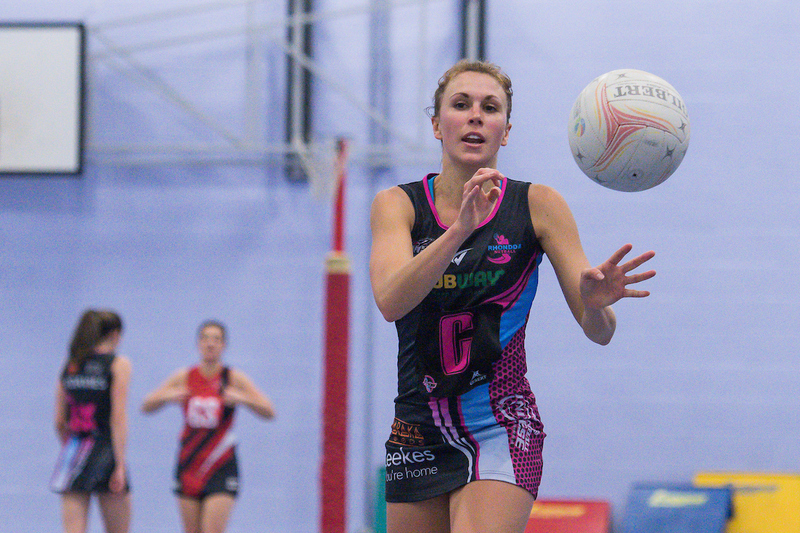 “The numbers that have come on board to play netball in the area is incredible,” says Cooke, who was a Wales teammate of long-time current Dragons stars Suzy Drane and Kyra Jones. “Lots of parents get involved and it has a real community feel. There are participation centres where anyone can get involved. The Rockets. Pic: Craig Thomas/Replay images. “Then, I will go around the clubs at the end of the year and pick the girls who have the potential to be in the representative structure. It’s this kind of rapid promotion that has led to 16-year-old Ashleigh Bourne breaking through into the senior Rockets team and becoming one of their outstanding players this season. Cooke believes the youngster has the potential to one day play for Wales, but the problem is the lack of natural steps towards that goal. There are no leagues or tournaments between the best of the local leagues, like the Cardiff Prem, and the Superleague Dragons. It’s like a ladder with all the middle rungs missing. “We are ticking all the right boxes with Ashleigh, but a conversation needs to be had about her future development,” adds Cooke. “She has a lot of potential and is one to watch. She has played every game for us this season and done really well. Ashleigh Bourne of the Rockets. Pic: Craig Thomas/Replay images. “But in Wales, there is a Superleague club and then the different local leagues around the country sit beneath that. There is no national or even north or south league and I think they’re missing a trick there. For the moment, though, the Rockets are trying to launch the likes of Ashleigh in the right direction. They beat Ogmore 66-16 last week and two more victories will be enough to make regulars Cooke, Jody Barnes, Jess Sutton, Chelsea Davies, Rachel Davies and Lottie Davies champions, at least, in their own corner of the universe. * The A470 League complained to Dai Sport that we had been “unprofessional” and “insulting” in naming Georgia Rowe as the Superleague player in the original publication of this article. The article was temporarily removed whilst facts were re-checked. We’re satisfied with the accuracy of the report and have re-published. Dai Sport has offered the A470 League a response, which we would be happy to publish.